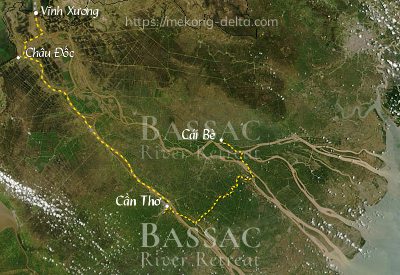 Enquire or book a trip along Cái Bè - Cần Thơ - Châu Đốc - Vĩnh Xương - Phnom Penh. Transfer on board a speedboat, which takes you to the shore at the frontier post for the emigration formalities. Once the formalities have been expedited, baording back onto the speedboat and departure towards Phnom Penh. End of services on shore at Vĩnh Xương.